Around last year, I read A Darker Shade of Magic by V. E. Schwab, and I LOVED it! It was an amazing concept, and it was exactly what I was looking for. 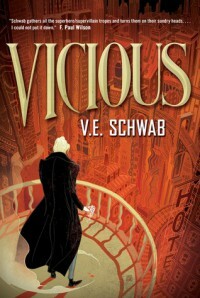 I was kind of scared to start Vicious because it didn’t seem anything like A Darker Shade of Magic so I wasn’t sure whether or not I wanted to read something like that. So, I decided to go into this book blind. I had no idea what it was about, but I managed to get into it by page one. I went through almost half of the book on the first day and I was completely hooked on the concept of EO’s. I also didn’t expect Victor and Eli’s characters to be so… monstrous, dark, I don’t really know how to describe it. But, just for the record, there are no good guys. It’s like they’re all fifty shades of bad. In reality, there is no good or bad person in this book. The simple fact is this: it’s Victor against Eli. We know Victor’s and Eli’s side of the story and where that has brought them in ten years. Even though this book is a decent size, I flew through it. I would think that I’d been reading for fifteen minutes but when I’d check the time it’d be like forty-five minutes! This book is perfect for people who like reading about twisted characters, and for people who really want to read something thrilling. If you want something that will make you read without realizing the time, then this is perfect. God, the ending was INSANE. I need the next book… NOW.